The International Centre is committed to providing a respectful, accessible and inclusive environment for all employees and visitors. We fully support the standards set by the Accessibility of Ontarians Disabilities Act (AODA) and are very pleased to say that our facility complies with all regulations. Multi-Year Accessibility Plan: The International Centre’s has established and will implement a Multi-Year Accessibility Plan outlining the Company‘s strategy to prevent and remove barriers and meet its requirements under this Regulation. This includes: posting the Multi-Year Accessibility Plan on the Website and providing the Plan in an accessible format upon request AND reviewing and updating the Plan. Integrated Accessibility Standards Policy: The International Centre is committed to treating all people in a way that allows them to maintain their dignity and independence. We believe in integration and equal opportunity. We are committed to meeting the needs of persons with disabilities in a timely manner, and will do so by preventing and removing barriers to accessibility and meeting accessibility requirements under the Accessibility for Ontarians with Disabilities Act. This policy will be implemented in accordance with the time frames established by the Regulation. Wheelchairs may be available on a show by show basis; please contact the show directly for more information. For a list of upcoming shows, please see our Events Calendar. To ensure total accessibility we’ve installed an elevator in the east end of the Conference Centre, north side of Hall 1 and is capable of accommodating one wheelchair plus one attendant. Accessible washrooms are located in the Conference Centre and Halls 1, 2, 3, 4, 5 and 6. Also, our unisex washrooms, which are located in the lobbies of Halls 2, 3 & 4, are roomy enough for a person with special needs plus an attendant, as well as for families with young children in strollers. Amplified public telephones are located throughout our facility. Lower-height, wheelchair-accessible telephones are also prevalent. 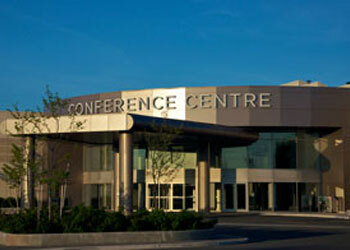 Our 24/7 Building Security Services is located in the Conference Centre main entrance. All security personnel are fully certified in fire safety, first aid, CPR and the use of defibrillators. Our North and South parking lots have 55 designated accessible spaces. The lots are also well lit, open 24/7, monitored by Security through fourteen cameras.